I received a fun message from Melanie over at the Teacher's Lounge yesterday. She asked if I would mind donating a product from my TeachersPayTeachers store to support Autism Awareness. I jumped at the chance! Autism is near and dear to my heart. I have had several students over the years, including this year, with Autism. Each year I have fallen in love with them and I am SO reluctant to pass them on to third grade because I just want to keep them forever! If you are a person who creates resources on TPT, please consider donating a product to help raise funds for families living with Autism! Click the picture below to get more details about Melanie's fundraiser. World Autism Awareness Day is April 2nd! 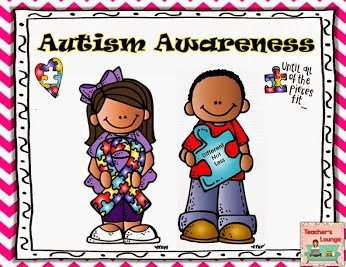 Help spread support and awareness of Autism by wearing blue this coming Thursday. AutismSpeaks.org has WONDERFUL information as well as merchandise you can purchase to support Autism awareness. Click the picture below to head over to their web site. 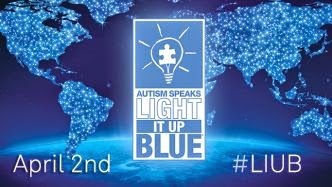 So don't forget - Light it Up Blue on April 2nd!